I came across this title first in the Guardian, which was reporting that it had won the Melissa Nathan Award for Comedy Romance in 2009. I like comedy romance. Plus it was set in India, plus it was written by a man. Both are rather unusual characteristics for romance, or at least the romances I usually read, so I thought I'd give it a shot. I am not sure I'd read it again, but I'd recommend it to someone who wanted a light romance that was a little different. Mr. Ali is a retired gentleman who has decided, because his wife needs him to be doing something other than hanging around the house making her life difficult, to open a marriage bureau. Chapter by chapter we meet the characters who need his help finding a suitable match, as well as his wife, his son, and some of his friends. As he becomes busier, he needs some help around the office, and Mrs. Ali finds him an assistant in the young, talented Aruna. Aruna has her own troubles and own story. I think the major problem was that, once again thanks to stupid blurbs, I was expecting something that this book simply is not. One of the blurbs on the back of the book suggests that "If Jane Austen had been lucky enough to set foot in modern-day India, she would have written The Marriage Bureau for Rich People." Which... no. Just no. It's an incredibly different piece from anything Austen wrote, different in style, different in feel, different in plot, different in character. It bears almost no resemblance to Austen aside from the fact that there is a romance between two young people and it's complicated by social mores. And maybe the fact that we don't get to the romance until much further along in the book. 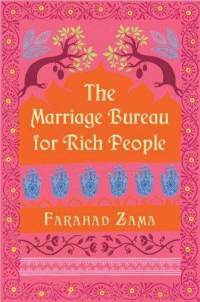 My first impression was that The Marriage Bureau for Rich People reads like a book about India written for people who aren't from India, which I suspect is not far off the mark. It can be a little explainy: of customs, of behaviours, of attitudes, of religions, of foods, of daily life in the city of Vizag. Since I'm not from India, nor at all familiar with really any of it except the North-Americanized version of delicious Indian food and a very little bit of surface knowledge about some of the other aspects, I actually quite enjoyed this primer. I just wasn't expecting a primer, so it took me some time to get into it. And sometimes the book was a bit heavy on the telling versus the showing in general, as though the descriptions of Indian life spilled over into the descriptions of character and plot. There's another comparison on the back of the jacket, this one to Alexander McCall Smith's No. 1 Ladies' Detective Agency, and this is much more apt. There is an episodic feel to the book: Mr. Ali, our matchmaker, meets prospective clients in each chapter and so we meet them too, and he solves a problem or finds a match or just generally interacts with them. Many of them pop up again later, but some don't. Then, in addition to these little vignettes, there are two overarching plots that get their starts early in the book but don't come to fruition until the end. Well, and one of the plots doesn't really resolve, exactly, though one thinks there might be a resolution on the horizon. I would definitely recommend this book to people who have liked Mma Ramotswe and the No. 1 Ladies' Detective Agency series. Overall, a sweet story with interesting flavours, a pleasant pace, and a satisfying ending. Light but not necessarily fluffy, this is a charming book to while away an afternoon or three for someone looking for a romance that's a little different from the usual fare and not the central aspect of the book, or for those of you who really like descriptions of food, or someone looking for a window into daily life in Visakhapatnam, India.